Upper left: "PERSICA / SIBYLLA / [.1. ]A"
Seated with her hands crossed in her lap, Isabella of Portugal, the duchess of Burgundy, conveys the poise and confidence of her noble position. Her sumptuous attire, heavily woven with gold thread, and her jeweled fingers and headdress reflect her aristocratic status. Oddly, the artist did not match the patterns of the sleeves, as would have been customary during this period. In fact, the duchess never actually sat for this portrait, which may account for the misunderstood representation of her clothing. Scholars believe that the artist copied Isabella's likeness from a lost portrait by Rogier van der Weyden. The tender, slightly mocking expression on the duchess's face and the elongated fingers reflect van der Weyden's concept of portraiture. The prominent inscription in the upper left corner of the panel, PERSICA SIBYLLA IA, suggests that the portrait was part of a series depicting sibyls. This identity strikingly contrasts with Duchess Isabella's costume. Scholars believe that someone other than the original artist added the inscription, as well as the brown background meant to simulate wood, some time after the portrait was painted. Source: Lorne Campbell. National Gallery Catalogues: The Fifteenth Century Netherlandish Schools (London: National Gallery, 1998). Baron Adolphe Carl von Rothschild, Austrian, 1823 - 1900 (Naples, Italy; Paris, France), by inheritance to Baron Maurice (Edmond Charles) de Rothschild, 1900. John D. Rockefeller, Jr., American, 1874 - 1960, owned jointly with his second wife, Martha Baird Rockefeller, upon their marriage, 1948. John D. Rockefeller, Jr., American, 1874 - 1960 and Martha Baird Rockefeller, American, 1895 - 1971 (New York, New York), upon his death, retained by his second wife, Martha Baird Rockefeller, 1960. Martha Baird Rockefeller, American, 1895 - 1971, by inheritance to Abigail Rockefeller Milton Pardee Mauzé, daughter of John D. Rockefeller, Jr., and his first wife Abby Aldrich Rockefeller, 1971. Abigail Rockefeller Milton Pardee Mauzé, 1903 - 1976, upon her death, held in trust by the estate. Estate of Abigail Rockefeller Milton Pardee Mauzé, 1903 - 1976, consigned to Thomas Agnew & Sons, Ltd. (London, England), by 1977. Thomas Agnew & Sons, Ltd. (London, England), sold to the J. Paul Getty Museum, 1978. "Mouvement des Arts, Collections Nieuwenhuys." La Chronique des Arts et de la Curiosité, no. 19 (May 12, 1883), p. 150. Galerie Saint-Luc, Brussels. Catalogue des Tableaux Anciens et Modernes [...] laissés par M. C.-J. Nieuwenhuys. May 4, 1883, p. 11, lot 4. (Emonnier), L. "Correspondance de Belgique." La Chronique des Art et de la Curiosité, no. 20 (May 15, 1885), p. 158. Friedländer, Max J. "Malerei. Niederländer und Deutsche." Ausstellung von Kunstwerken des Mittlalters und der Renaissance aus Berliner Privatbesitz, exh. cat. (Berlin: G. Grote'sche Verlagbuchhandlung, 1898-99), p. 7. Hymans, Henri. "Correspondance de Belgique." Gazette des Beaux-Arts 23, no. 513 (March 1900), p. 246. Laban, Ferdinand. "Ein neuer Roger." Zeitschrift für bildende Kunst, n.s., 19 (1908), pp. 58, 62, ill.
Maeterlinck, L. "Le 'Maître de Flémalle' et l'école gantoise primitive." Gazette des Beaux-Arts 10, no. 673 (July 1913), p. 58. Winkler, Friedrich Maeterlinck. Der Meister von Flémalle und Rogier van der Weyden (Strasbourg: Heitz & Mundel, 1913), pp. 53, 54, 107, 174. Friedländer, Max. Von Eyck bis Brueghel (Berlin: 1916), p. 175. Reinach, Salomon. Répertoire de peintures du Moyen-Age et de la Renaissance (1280-1580). 6 vols. (Paris: Maison Ernest Leroux, 1905-23), vol. 4 (1918), p. 243, no. 2. Friedländer, Max. Von Eyck bis Bruegel (Berlin: Julius Bard, 1921), p.185. de Ricci, Seymour, and Martin Conway. "A Flemish Triptych for Melbourne, Part II." Burlington Magazine 40, no. 226-231 (January-June 1922), p. 166, pl. III-P.
Bürger, Willy. Rogier van der Weyden (Leipzig: Verlag von Karl W. Hiersemann, 1923), p. 70, pl. 50b. Friedländer, Max J. Die altniederländische Malerei. Vol. 2, Rogier van der Weyden und der Meister von Flémalle (Berlin: P. Cassirer, 1924), pp. 41, 95, no. 13. Reinach, Salomon. "Rogier van der Weyden and the Maître de Flémalle." Burlington Magazine 40, nos. 274-79 (January-June 1925), p. 112. Stein, W. "Die Bildnisse von Rogier van der Weyden." Jahrbuch der preuszischen Kunstsammlungen 47 (1926), pp. 10-13, fig. 4. Demonts, Louis. "L'exposition d'art flammand à la Royal Academy de Londres." Gazette des Beaux-Arts 15, no. 777 (May 1927), pp. 257-78. Devigne, Marguerite. "Une collection d'oeuvres d'art à Tournai au commencement du XVIIe siècle." Annales de XXIV congrés (Tournai 1921) (Tournai: Établissements Casterman, 1927), p. 344n1. Devigne, Marguerite. "Notes sur l'exposition d'art flamand et belge à Londres." Oud Holland 44, nos. 1-6 (1927), pp. 72-74, ill.
Schneider, Hans. "Die Ausstellung flämische und belgischer Kunst in London." Zeitschrift für Bildende Kunst 61 (1927-28), p. 40. Exhibition of Flemish and Belgian Art, 1300-1900, exh. cat. (London: Royal Academy of Arts, 1927), p. 22, no. 29. Jamot, P. "Rogier van der Weyden et le prétendu Maîtres de Flemalle." Gazette des Beaux-Arts, 5th ser., 18, no. 791 (November 1928), pp. 276-77, ill. facing p. 280. Friedländer, Max J., ed. Catalogue of a Loan Exhibition of Flemish Primitives in Aid of the Free Milk Fund for Babies, Inc., exh. cat. (New York: F. Kleinberger, Inc., 1929), p. 40, no. 7. Destrée, Jules. Rogier de la Pasture-van der Weyden (Paris and Brussels: Les Éditions G. van Oest, 1930), vol. 1, p. 181. "Our Colored Plates." Apollo 14, no. 82 (October 1931), p. 184, 248, ill.
Reis-Santos, L. "Un Portrait d'Isabelle de Portugal, Duchesse de Bourgogne, daté de 1470." Revue belge d'archéologie et d'histoire de l'art 5 (1935), pp. 135-37. Troche, E.G. Niederländische Malerei des Fünfzehnten und Sechszehnten Jahunderts (Berlin: Kurt Wolff Verlag, 1935), p. 32, no. 18, ill.
Kerber, Ottmar. "Rogier van der Weyden und die Anfänge der neuzeitlichen Tafelmalerei." Inaugural diss. (Ludwig-Maximilians Universitat zu Munchen, 1936), pp. 34-41, 105, ill.
Sipple, Ella S. "Art in America--Exhibitions Past, Present and Promised." Burlington Magazine 69, nos. 400-405 (July-December 1936), p. 92. Catalogue of the Twentieth Anniversary Exhibition of the Cleveland Museum of Art, exh. cat. (Cleveland: Cleveland Museum of Art, 1936), p. 86, no. 212, pl. 45.
de Loo, G. Hulin. "Weyden (Rogier de la Pasture, alias Van der)." Biographie Nationale. Vol. 27, Waasberghe-Zypaeus (Brussels: Établissements Émile Bruylant, 1938), columns 240-41. Comstock, Helen. "The New York World's Fair: Loan Exhibition of Masterpieces." Connoisseur 103, no. 454 (June 1939), p. 318. McCall, George Henry, and William R. Valentiner, eds. Catalogue of European Paintings and Sculpture from 1300-1800, exh. cat. (New York: World's Fair, with Masterpieces of Art, 1939), p. 201, no. 410, pl. 48. Valentiner, William R., and Alfred M. Frankfurter. Masterpieces of Art: Exhibition at the New York World's Fair 1939, Official Souvenir Guide and Picture Book, exh. cat. (New York: The Art News, 1939), p. 2, pl. 37.
van Puyvelde, Leo. "De Reis Jan van Eyck naar Portugal." Koninklijke Vlaamsche academie voor taal en letterkunde (January 1940), p. 27. Wescher, Paul. "Das Höfische Bildnis von Philipp dem Guten bis zu Karl V." Pantheon 28 (July-December 1941), p. 196, ill.
Flemish Primitives: An Exhibition Organized by the Belgian Government [...], exh. cat. (New York: M. Knoedler and Company, 1942), pp. 26-27, ill.
Michel, Edouard. L'école flamande du XVe siècle au Musée du Louvre (Brussels: Cercle d'art, 1944), p. 78. Musper, T. Utersuchungen zu Rogier van der Weyden und Jan van Eyck (Stuttgart: W. Kohlhammer Verlag, 1948), p. 25, fig. 89. Beenken, Herman. Rogier van der Weyden (Munich: F. Bruckmann, 1951), pp. 74-75, fig. 93. Cortez, J. "Infantes de Avis, II. D. Isabel duquesa de Borgohnam." Belas Artes, 2nd ser., no. 5 (1953), pp. 41-42, fig. 1. Panofsky, Erwin. Early Netherlandish Painting: Its Origins and Character. 2 vols. (Cambridge: Harvard University Press, 1953), vol. 2, unpaginated, fig. 363. Santos, R. Dos. "Retratos do sécolo XV." Belas Artes, 2nd ser., no. 5 (1953), pp. 34-35. Panofsky, Erwin. Early Netherlandish Painting: Its Origins and Character. 2 vols. (Cambridge: Harvard University Press, 1953), vol. 1, pp. 293-94, 478n1-6. Ruival, Maria Julieta. "Estudos Iconograficos. D. Isabel, Duquesa de Borgonha filha de D. Joao I de Portugal." Belas Artes, 2nd ser., no. 20 (1964), pp. 92-95, 103-5. Feder, Theodor H. "A Reexamination through Documents of the First Fifty Years of Roger van der Weyden's Life." The Art Bulletin 47, nos. 3-4 (September-December 1966), pp. 416-31. Bauch, Kurt. "Die Bildnisse von Jan van Eyck." In Studien zur Kunstgeschichte (Berlin: Walter de Gruyter & Co., 1967), p. 89. Friedländer, Max J. Early Netherlandish Painting. Vol. 2, Rogier van der Weyden and the Master of Flémalle. Heinz Norden, trans. (Leyden: Sijthoff, 1967), pp. 26, 62, 111, no. 13, pl. 22. Anonieme Vlaamse Primitieven, exh. cat. (Bruges: Groeningemuseum, 1969), p. 239-40. Sonkes, Micheline. Dessins du XVe siècle: Groupe Van der Weyden. In Les Primitifs Flamands. Section 3, Contributions à l'étude des primitifs. Vol. 5 (Brussels: Centre national de recherches Primitifs Flamands, 1969), pp. 111, 112. Davies, Martin. "Rogier van der Weyden's 'S. Ivo(?)'." Burlington Magazine 113, no. 817 (April 1971), p. 178. Hoff, Ursula, and Martin Davies. The National Gallery of Victoria, Melbourne. In Les Primitifs Flamands. Section 1, Corpus de la peinture des anciens Pays-Bas méridionaux au quinzième siècle. Vol. 12 (Brussels: Centre national de recherches Primitifs Flamands, 1971), pp. 4, 18n10. Sterling, Charles. "Observations on Petris Christus." Art Bulletin 53, no. 1 (March 1971), p. 18n67. Davies, Martin. Rogier van der Weyden: An Essay, with a Critical Catalogue of Paintings Assigned to Him and to Robert Campin (London: Phaidon, 1972), pp. 230-31, pl. 98. Ruival, Maria Julieta. "The 'Portrait of a Lady' in the Metropolitan Museum, New York, and its Connection with the 'Portrait of D. Joao 1' in the National Museum of Ancient Art in Lisbon." Belas Artes, 2nd ser., no. 27 (1972), pp. 112, 113, 114, 116, 117, fig. 2. Hoffman, Edith Warren. "Simon Marimon or the Master of the Altarpiece of Saint-Bertin: A Problem of Attribution." Scriptorium 27, no. 2 (1973), p. 281. Fredericksen, Burton B., Jiří Frel, and Gillian Wilson. Guidebook: The J. Paul Getty Museum. 4th ed. Sandra Morgan, ed. (Malibu: J. Paul Getty Museum, 1978), p. 72, ill.
"Paintings Acquisitions." The J. Paul Getty Museum Calendar, no. 12 (December 1978-February 1979), unpaginated, ill.
Rogier van der Weyden, Rogier de le Pasture: Peintre officiel de la Ville de Bruxelles, Portraitis de la Cour de Bourgogne, exh. cat. (Brussels: Centre culturel du Crédit communal de Belgique, 1979), pp. 151-52, no. 14. Strachwitz, A.G. "Brüssels offizieller Stadtmaler." Weltkunst 49, no. 23 (December 1979), pp. 3148-49. Fredericksen, Burton B. Masterpieces of Painting in the J. Paul Getty Museum (Malibu: J. Paul Getty Museum, 1980), unpaginated, no. 23, ill.
Fredericksen, Burton B., Jiří Frel, and Gillian Wilson. The J. Paul Getty Museum Guidebook. 5th ed. (Malibu: J. Paul Getty Museum, 1980), p. 60. Smith, Alistar. "Current and Forthcoming Exhibitions: Brussels." Burlington Magazine 122, no. 922 (January 1980), p. 91. O'Meara, Carra Ferguson. "Isabelle of Portugal as the Virigin in Jan van Eyck's Washington Annunciation." Gazette des Beaux-Arts 97, no. 1346 (March 1981), pp. 99, 101, fig. 4. Friedman, Jane. "A New Look at the Imagery of Isabelle of Portugal." Source 1, no. 4 (Summer 1982), pp. 11, 12n9. Jolly, Penny Howell. "Antonello da Messina's 'St. Jerome in His Study': A Disguised Portrait?" Burlington Magazine 124, no. 946 (January 1982), p. 29n8. de Bisthoven, Aquilin, Margriet Baise Dondeyne, and Dirk de Vos. Musée Communal des Beaux-Arts (Musée Groeninge) Bruges. 3rd ed. In Les Primitifs Flamands. Section 1, Corpus de la peinture des anciens Pays-Bas méridionaux au quinzième siècle. Vol. 1 (Brussels: Centre national de recherches Primitifs Flamands, 1983), pp. 87, 93. Fletcher, John. "The Study of Early Paintings on Flemish Panels." Jaarboek van het Koninklijk Museum voor Schone Kunsten Antwerpen (1984), pp. 16, 18-19. Harbison, Craig. "Visions and Meditations in Early Flemish Paintings." Simiolus: Netherlands Quarterly for the History of Art 15, no. 2 (1985), p. 94n21. Janssonius, Mart. Isabella van Portugal Moeder van Karel de Stoute (Zutphen: Thieme, 1985), ill. facing title page. Prevenier, Walter, and Wim Blockmans. The Burgundian Netherlands (Antwerp: Fonds Mercator, 1985), pp. 146-47, ill.
Comblen-Sonkes, Micheline, and Nicole Veronee-Verhaegen. Le Musée des Beaux-Arts de Dijon. In Les Primitifs Flamands. Section 1, Corpus de la peinture des anciens Pays-Bas méridionaux au quinzième siècle. Vol. 12 (Brussels: Centre national de recherches Primitifs Flamands, 1986), p. 8. Delenda, Odile. Rogier van der Weyden (Paris: Editions du Cerf, with Tricorne, 1987), pp. 10-11. Dixon, Laurinda S. "Portraits and Politics in Two Triptychs by Roger van der Weyden." Gazette des Beaux-Arts 109, nos. 1420-21 (May-June 1987), pp. 187-88, fig. 7. Jolly, Penny Howell. "More on the Van Eyck Question: Philip the Good of Burgundy, Isabelle of Portugal, and the Ghent Altarpiece." Oud Holland 101, no. 4 (1987), pp. 243, 251, no. 19, fig. 9. Weightman, Christine. Margaret of York, Duchess of Burgundy, 1446-1503 (Gloucester and New York: Alan Sutton and St. Martin's Press, 1989), p. 50, ill.
Lamcastre, Mariade, and Teresa Abecassis, eds. Des Princesses partent, D'autres arrivent: Isabelle de Portugal, du Palais de Sintra audché de Bourgogue (Lisbon: Associação Acordar História Adormecida, 1991), p. 67, cover ill.
Lemaire, Claudine, and Michéle Henry. Isabelle de Portugal: Duchese de Bourgogue, 1397-1471 (Brussels: Bibliothèque royale Albert Ier, 1991), pp. 148-49, no. 39, cover ill.
Lightbown, Ronald W. Mediaeval European Jewellery with a Catalogue of the Collection of the Victoria and Albert Museum (London: Victoria & Albert Museum, 1992), p. 457, pl. 104. Ainsworth, Maryan Wynn, et al. Les Primitifs Flamands et leur Temps (Louvian-la-Neuve: La Renaissance du Livre, 1994), p. 221, ill.
Kenyon, Kathleen Louise. "Portrait Painting in the Time of Philip the Good, Duke of Burgundy, 1419-67." M.A. diss. (San Jose State University, 1996), pp. 58-59, 97. Campbell, Lorne. "Rogier van der Weyden." In The Dictionary of Art. Vol. 33, Wax to Zyvele (New York: Grove, 1996), p. 123. Jaffé, David. Summary Catalogue of European Paintings in the J. Paul Getty Museum (Los Angeles: J. Paul Getty Museum, 1997), p. 135, ill.
Franke, Birgit. "'Huisvrouw', Ratgebern und Regentin." Jahrbuch der Berliner Museen 31 (1997), pp. 33-34, ill.
Campbell, Lorne. National Gallery Catalogues: The Fifteenth Century Netherlandish Schools (London: National Gallery Publications, 1998), pp. 434, 437-38, fig. 4. Somme, Monique. Isabelle de Portugal, Duchesse de Bourgogne: Une femme au pouvoir au Xve siècle (Paris: Presses Universitaires du Septentrion, 1998), p. 42. Kemperdick, Stephan. Masters of Netherlandish Art: Rogier van der Weyden, 1399/1400-1464. Anthea Bell, trans. (Cologne: Könemann, 1999), p. 58, no. 57, ill.
de Vos, Dirk. Rogier van der Weyden: The Complete Works (Antwerp and New York: Mercatorfonds, with Harry N. Abrams, Inc., 1999), pp. 374-75, no. B14, ill.
Châtelet, Albert. Rogier van der Weyden : Problèmes de la vie et de l'oeuvre (Strasbourg: Presses Universitaires de Strasbourg, 1999), pp. 220-21. Kuijer, P. Th.J. 's-Hertogenbosch. Stad in het Hertogdom Brabant ca. 1185-1629 (Zwolle: Waanders, 2000), p. 121, ill.
Buck, Stephanie. Die niederländischen Zeichnungen des 15. Jahrhunderts im Berliner Kupferstichkabinett. Kritischer Katalog (Turnhout: Brepols, 2001), p. 270, no. 121, ill.
Campbell, Lorne, and Yvonne Szafran. 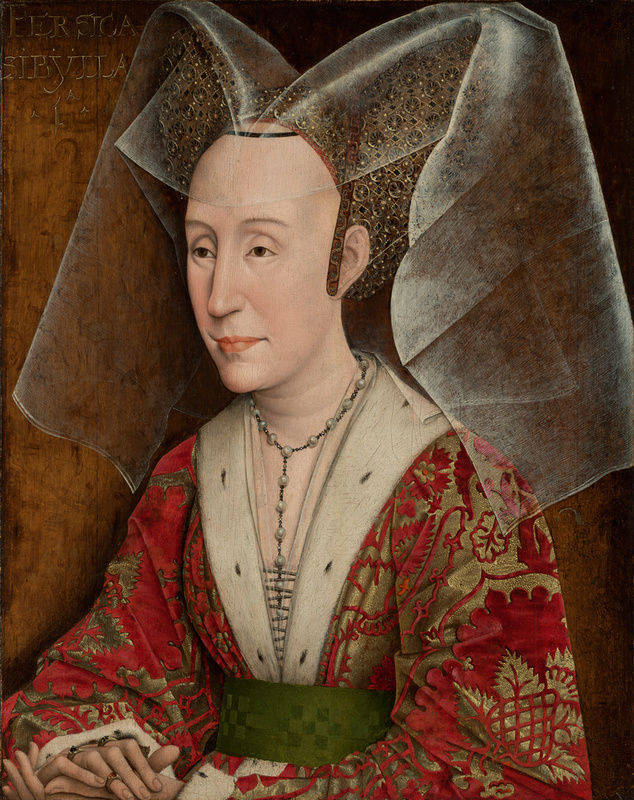 "The Portrait of Isabella of Portugal, Duchess of Burgundy, in the J. Paul Getty Museum." Burlington Magazine 146, no. 1212 (March 2004), pp. 148-57. Berkemeier-Favre, Marie-Claire. Die Votivtafel der Herzogin Isabella von Burgund (Basel: Historisches Museum, 2004), pp. 18-19, fig. 9. Campbell, Lorne. "More on Philippe de Croÿ and Jean de Froimont." Burlington Magazine 147, no. 1223 (February 2005), pp. 108-9. Kemperdick, Stephan, and Jochen Sander, eds. The Master of Flémalle and Rogier van der Weyden: The Birth of Modern Painting, exh. cat. (Frankfurt: Städel Museum, 2009), pp. 364-67, no. 40, ill., entry by Jochen Sander. Kemperdick, Stephan, and Jochen Sander. "The Master of Flémalle, Robert Campin, and Rogier van der Weyden: A Résumé." In The Master of Flémalle and Rogier van der Weyden: The Birth of Modern Painting, exh. cat. Stephan Kemperdick and Jochen Sander, eds. (Frankfurt: Städel Museum, 2009), p. 159. Klein, Peter. "Dendrochronological Analysis of Panel Paintings Belonging to the Master of Flémalle and Rogier van der Weyden Groups." In The Master of Flémalle and Rogier van der Weyden: The Birth of Modern Painting, exh. cat. Stephan Kemperdick and Jochen Sander, eds. (Frankfurt: Städel Museum, 2009), p. 166. Bonaventura, Paul. "Transcendental Reality." Apollo 169, no. 563 (March 2009), pp. 136-37, fig. 4. Campbell, Lorne, and Jan Van der Stock, eds. Rogier van der Weyden, 1400/1464-Master of Passions, exh. cat. (Zwolle and Leuven: Waanders and Davidsfonds, 2009), pp. 297-99, no. 15, ill., entry by Lorne Campbell. Scott, Margaret. "Dress and Reality in Rogier van der Weyden." In Rogier van der Weyden, 1400/1464-Master of Passions, exh. cat. Lorne Campbell and Jan van der Stock, eds. (Zwolle and Leuven: Waanders & Davidsfonds, 2009), p. 138. Sommé, Monique. "La correspondance d'Isabelle de Portugal, reflet du pouvoir d'une duchesse de Bourgogne au XVe siècle." In Women at the Burgundian Court: Presence and Influence. Dagmar Eichberger et al., eds. (Turnhout: Brepols, 2010), pp. 27, 164, pl. 7. Woods, Kim W. "Art at Court." In Art & Visual Culture, 1100-1600: Medieval to Renaissance. Kim W. Woods, ed. (London: Tate Publishing, with The Open University, 2012), p. 180, pl. 5.6. Woollett, Anne T. "Foreword: Early Netherlandish Painting in the Getty Collection." In Los Angeles Museums, Corpus of Early Netherlandish Painting. Diane Wolfthal and Cathy Metzger (Brussels: Royal Institute for Cultural Heritage, 2014), p. 7. Wolfthal, Diane, and Cathy Metzger. Los Angeles Museums, Corpus of Early Netherlandish Painting (Brussels: Royal Institute for Cultural Heritage, 2014), pp. 190-205. Campbell, Lorne, ed. Rogier van der Weyden and the Kingdoms of the Iberian Peninsula, exh. cat. (Madrid: Museo Nacional del Prado, 2015), pp. 112-14, no. 7, ill., entry by Lorne Campbell. Campbell, Lorne. "Rogier van der Weyden: His Life and Work." In Rogier van der Weyden and the Kingdoms of the Iberian Peninsula, exh. cat. Lorne Campbell, ed. (Madrid: Museo Nacional del Prado, 2015), p. 23. Kemperdick, Stephen. Review of Corpus of Early Netherlandish Painting: Los Angeles Museums, by Diane Wolfthal and Cathy Metzger. Burlington Magazine 159, no. 1373 (August 2017), pp.640-41, ill.